On Sunday 12 November, Andrew Marr interviewed David Davis MP, Shadow Home Secretary. Please note "BBC Sunday AM" must be credited if any part of this transcript is used. ANDREW MARR: Good morning. I don't see you as a great hoodie hugger but am I wrong about that? DAVID DAVIS: Well of course famously at the Party Conference I said I'd hug a hoodie just longer and harder which the Conference liked anyway. The, there are two halves to this. I mean famously somebody said you know that being tough on crime and tough on the causes of crime. And what David's talking about is the cause of crime. Family break up, the problem of youngsters with no guidance, leaving school too early, high truancy levels. You should have asked Alan Johnson about that earlier and what he's going to do about that when they, when he had them in at eighteen. All those issues drive crime. And we've got to do two things. We've got to deal with crime, be tough on crime. And you know I've been talking about prisons. And no doubt we'll talk later about all these things, on the one hand. But the other hand we've got to actually shut down the sources of crime and that's, that's something that Tony Blair promised ten, twelve years ago and has never delivered on. ANDREW MARR: Let's turn to really the subject of the day which has been terrorism in the, in the wake of the MI5 speech and all the other comments. Pretty terrifying to people. Do you take entirely seriously the fact that there are possibly up to a hundred thousand people in this country who supported what happened on September, on July the seventh in London? DAVID DAVIS: Yeah we take it very seriously. Whether the number's that big I would, I would doubt. But ..
ANDREW MARR: You don't think there's a hype going on of any kind? ANDREW MARR: Well you have to worry about overstating this. But clearly there's a serous threat. Clearly the prospect of, of tens or hundreds or even thousands of people being killed by Al Qaeda or people who are sympathisers of Al Qaeda has to be taken seriously by any government and any opposition. Indeed you will remember last year when the seventh of July bombing happened, we the opposition were extremely careful not to give any succour to the, to the terrorists by attacking the government at the time. We actually offered them by-partisan talks, we offered them ideas for the, for the upcoming terrorist Bill. And we also brought it forward. So you know we take it very seriously and we take it very seriously that we shouldn't allow British society to be split by it. ANDREW MARR: Does this new level of threat or new discussion about the level of threat cause you in any way to revise your thinking on for instance detention of suspects? Because it seems to me that the government are going to try and bring this back in again. DAVID DAVIS: Well they may. Although even, even Sir Ian Blair was ambivalent about it. He didn't say we should do it he said we should think about it. And we've talked to him about these issues. And it was quite interesting. Last year when a number of people were making the argument, before last year, were making the argument on ninety days Andy Hayman, the commission at the Met who was making the argument for it drew up a fictional case and said this might happen. And the conditions in that fictional case were a foreign intelligence organisation involved so you can't speed them up so you need ninety days. DAVID DAVIS: Computer data encrypted involved so you may need ninety days. Having to work very fast to pre-empt an attack so you're not ready for it, so you need nin..., may need ninety days. That's an exact description of what happened in August this year. And they charged most people after fourteen days and all of them before the twenty eight days were up. ANDREW MARR: If the government came back with new parliamentary safeguards however would you be against extending the twenty eight days in all circumstances or would you look at it again? DAVID DAVIS: I'm not sure you can provide parliamentary safeguards. I mean what we would do is we'd look at the argument, we'll look at the evidence. We looked last time at the evidence in great detail. I mean some of the things have been talked about today actually Gordon Brown's picked up on in the papers and actually Sir Ian Blair's picked up on and John Reid's picked up on were things that we suggested last year. For example Michael Howard and I went for a briefing. Now most, most of that briefing was secret so I can't tell you the details of it. But the simple truth was I said to the, the Cabinet ... telling us about the reasons for their, in their view ninety days. They said well, I said why don't you just charge the people. If you are certain they're terrorists charge them and even before you've got all the evidence and then collate the evidence later. "Oh we can't interview them after charge about the subject of the charge". So I said "Okay, change that". It's taken them a year even to get ..
ANDREW MARR: To get to that point. DAVID DAVIS: .. to get to that point. ANDREW MARR: Just to be absolutely clear about this. You could look at beyond twenty eight days in certain circumstances? DAVID DAVIS: Yeah I'm, I'm, I'm, I'm not inclined to it because after all twenty eight days is the longest in the western world. ANDREW MARR: But you're not unpersuadable? DAVID DAVIS: No. Because if they turned round and had a sort of rock solid case. But I have to tell you the arguments I've seen so far both in public ..
DAVID DAVIS: .. and in secret, and worse than aren't great. They're dreadful. ANDREW MARR: Okay. Let's turn to one of the Conservative proposals which is for a Cabinet Minister in charge of terrorism. Some people will say well that's, that's tokenistic. Yet another minister sitting round the table. So what? DAVID DAVIS: Well hardly. I mean it's quite interesting. The, the, Gordon Brown saying "When I'm Prime Minister I'll be the ter..." - well the headline was "Terror over lord". Made his sound like something from Torchwood. But I'm sure he didn't mean that. But there'd be there, he'd be in charge of the anti, the counter terror policy. Well of course all prime ministers are. All heads of MI5 and MI6 and GCS, you have direct access to the Prime Minister for precisely that reason. But they can't spend the time on it. A Home Secretary today particularly at the moment with foreign prisoners and immigration collapse and all the other problems they have can't spend the time on it. Now there's been a consequence to this. DAVID DAVIS: Let me finish. Cos there are other elements to it. Somebody said in the papers today, a minister said "We've lost a year since the seventh of July in terms of dealing with the, getting through to the Muslim community". They've lost a year. Now you, earlier on we had problems with not having done the work in terms of getting these, the, the provinces as it were, not the capital, provincial cities like where I come from, ready and prepared for an attack. Now that needs somebody to drive it. And it can't be the Prime Minister and it can't be the Home Secretary cos they're too busy doing other things. You need somebody to do it. As it is at the moment it's, it's h..., it's handed off to a junior minister. When Beverley Hughes was sacked for the, the Immigration Minister was sacked for the failures in immigration she was actually the Counter Terrorism Minister. The next day the journalist rang up number ten and the Home Office to say who was going to take over. They gave different names. That's how un-coordinated it all is. DAVID DAVIS: You need somebody with ..
DAVID DAVIS: .. power and clout and determination. ANDREW MARR: And you'd be happy as, as a future Home Secretary if that's what you were, to have your responsibilities divided in that way? DAVID DAVIS: Yeah I'm very largely the ..
DAVID DAVIS: .. architect of this, of this policy. So yes, yeah. ANDREW MARR: Let's move to crime because it's pretty clear from all the briefing that the Queen's speech is going to focus on crime. And that if you like there is a political strategy involved which is to say the Conservatives are no longer tough on crime. Do you not think that a lot of your own supporters are a little worried and bemused about some of the things that have been coming out from the Party, possibly particularly from David Cameron, about loving hoodies and being, and being nice to thugs and understanding more ..
ANDREW MARR: .. and blaming less and all this stuff? DAVID DAVIS: With respect I don't think it's being nice to thugs at all. I mean the, what, as I said before ..
DAVID DAVIS: Yes. Forgive me if I call that a BBC paraphrase. The, the simple truth is that it's about two things. It's about cause of crime and crime itself. And nobody can argue. I mean it's a, to be frank it's implausible to argue that we're, that we're not tough on crime. And I've been arguing for three years on this issue. Take this, take the, one of the hot issues of the year, the thing that lost or helped lose Charles Clarke his job earlier this year and that is the, the sheer pressure on prison places and all that come out of that. Murders on parole. Foreign prisoners being released rather than deported. The inability here to get people into prisons. Light sentences. All these come out of that single core issue. And I said very firmly we need more prisons. We were the ones who made that argument. We need more prisons. What happened? Within, within less than a month the government followed. We drove that policy ..
DAVID DAVIS: .. not the other way round. That's not being soft on crime at all. ANDREW MARR: Another hot, hot issue probably as hot as that is the question of immigration. A net influx of five hundred people or so a day at the moment. Do you think that is sustainable? Do you think we need to see less immigration in total into this country? DAVID DAVIS: Yes I do. I mean we said that earlier, earlier this week with a study on economic migration. I mean what we've done is we've separated out the three big, three or four big categories and said let's look at economic migration from outside of the European Union. We control that. We don't necessarily control the European Union but we do control that. Two hundred and twenty, two hundred and fifty thousand people last year. And all we're saying here is look you don't just make an economic judgment. Of course that's important. After all the government's virtually lifted our points scheme on that. You do, you make an economic judgment. But you also make one about how many houses you've got, how many schools you've got, how many, you know what the infrastructure's like, what it's doing to community cohesion. You look at places like Slough which have had really hard pressure on, on some of their public services. And you say okay, let's make a judgment as to how many we can take in in a year and limit it to that. It's a very simple idea, controlling immigration, keeping it at a managed level, recognising the real virtues from immigration but also only if it's controlled. ANDREW MARR: So what do you think's ..
ANDREW MARR: .. going on here. I mean you know we're hearing a lot of briefing from Doctor Reid and his people, Gordon Brown's in the papers. Everybody is aiming in at, at you or at least your, your agenda. 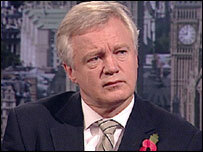 DAVID DAVIS: Yeah well it's a place I'm happy to be but the, but, well there are two things going on actually. I mean the thing that most obviously seems to be going on is a sort of leadership contest, contest in the Labour Party. And they're trying to sort of use this as a, as a mechanism or a way of proving their capability. Hence you've got both Gordon Brown and John Reid on the front pages of today's newspapers talking at, talking about this issue. But you know I take the view that you, you know this, this isn't actually about whether it's right or left, it should be about whether it's right or wrong. And for the government or John Reid or Gordon Brown to try and position themselves in their terms to the right of the Tory Party is just silly. The public are not going to forget that they let out over a thousand foreign prisoners onto the streets who should have been deported in the last year, that there since then there's been another couple of thousand let out as well. They're not going to forget the failures of immigration. They're not going to forget the, the dropping detection rates and the fact that people are being let out of prison too early. All those things are a measure of protecting the public. That's all that matters here. DAVID DAVIS: And I think the Labour Party are making a serious misjudgement if they imagine that by posturing in this way without the delivery - and that's the point - without the delivery, then they're going to get any gain out of it. ANDREW MARR: And finally ID cards. Do you remain hostile to compulsory ID cards? DAVID DAVIS: Oh yes. I mean the idea that the way you control for example the latest - there have been six reasons for ID cards. Each one's been dropped ... The latest one is immigration. The idea that the point to catch an illegal immigrant is after he's got in the country and disappeared into the community rather than at the border is laughable. We need decent border controls not repression on everybody else in the country ..
DAVID DAVIS: .. and intrusion of their privacy. ANDREW MARR: David Davis we'll have another word in a moment but for the time being thank you very much indeed.